MAKE MONEY WITH A KICK-A$$ GARAGE SALE! 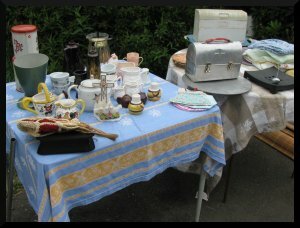 Why is the hungry-entrepreneur writing about having a garage sale? Well, sometimes a business owner needs a little quick cash. No shame there... that's a business fact of life. Get used to it. But sometimes a person with a home-based business just needs to get the house in order to make it a better place to spend time. I'm not going into the science of Feng-Shui, but clutter is distracting in many ways. In my case, I'm tired of seeing it, and I want to reclaim the space it's stored in for my own business needs. Much as I love working while sitting on my couch or in the plumbing business office, I want a room of my own to write in. I have one that would be perfect. The trouble is, it's full of stuff. You can throw your stuff away. Oooh, that one hurts to think about! When I was growing up, my family lived near my grandmother. She raised her family during the Depression-era 1930s. Throwing away something reusable or wasting resources was almost a sin! “Waste Not, Want Not", was our family mantra. So I can't bear to throw away things like clothing, books or other things that could be reused. Maybe somebody you know could use some of your 'now un-needed' stuff. That's a simple solution, and one I really like. If I can share something I no longer have a use for with a friend or family member, it's a good deal for both of us. But some people object to using second-hand things. I can't relate to that since I've been a thrift-store shopper by choice since high-school, but to each his own. Just ask them... if they say no, don't push it. You can donate it to a charitable organization. And I do that, but as a person that sells things on eBay, and being aware that 'one person's trash is another's treasure', I only donate after I've tried to get some money back from it. That leaves you with the last choice... having a good old-fashioned garage sale. There's not too much involved in getting rid of stuff like this. But making money with a garage sale is the trick. You don't want to sit in the driveway or garage for two days for $20.00, do you? Me either. Been there, done that, it sucked! As I'm getting ready for yet another purge of stuff this weekend, I started thinking about what I could do to make this one a more successful sale. I'd like to share with you, step by step, my ways to be sure your sale is a success. Be organized! Choose a day, time, etc. Pay attention to holidays, etc. There's less shoppers for your sale if everyone's gone out of town for the weekend. Also, see if any neighbors are planning a garage sale soon. Having another sale nearby can attract more people to both sales. 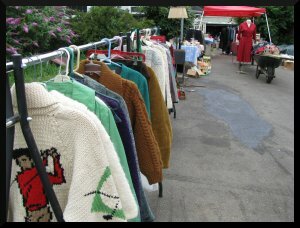 Do you need a permit or license to have a garage sale? I've heard that some areas require them. Fnd out now before you make any more plans. Watch your local weather report. I know that weather predictions are often wrong, but at least you can make an “educated” guess (same as the weather forecasters) that way. Rain is a disaster for your garage sale, and so is extreme heat! 1 or 2 weeks before the sale begin to sort your stuff. Try to have a central staging area for pre-sale organizing. I've found it helps to mark things with their price as you sort. That way it isn't a last minute chore. Find or buy the things you need to run the garage sale while you're still planning the sale. Anything that helps you run the sale easier, with less last-minute stress, is a good investment. You'll need pricing and marking stuff, (like tags, masking tape, or signs for tables). Balloons or other attention-getters for your signs are nice too. You'll need tables to display your things on. Bookshelves are nice if you have lots of books. Try to find clothing racks or a strong clothesline that can display clothing on hangers (especially if you have nice stuff). It may be 'over the top', but if you have clothing, how about rigging up a dressing room? Don't forget comfy chairs for you and your helpers to sit in, and a table to hold your coffee and other necessities. A cover to protect you from sun and rain is nice. Have paper & and a pen handy to keep track of who's stuff is sold (if you're selling more than your own stuff). You'll need bags and boxes to put sold stuff in. And newspapers to wrap breakables in if you want to be super-nice. Hot or cold drinks, or munchies for sale are a good way to involve the kids. 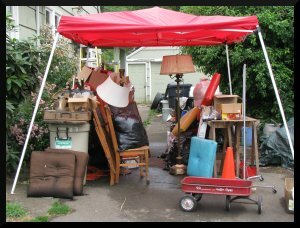 Advertise your garage sale!If nobody knows about your sale, you'll be waiting in vain for the shoppers to arrive and the money to roll in. Advertise your sale somewhere... either in the classified ads in your local newspaper, on the internet. You need signs posted around your area to tell people the important things, like the days of sale, hours, address. Make a list of exactly where you've posted the signs so you can be sure to remove signs after sale is finished. Again, check to find out what is legal to post in your area. Some places won't allow signs on utility poles or other places. You don't want the local police to be the first visitors at your sale! Day of sale stuff--- Do you have money to make change? You need something to keep it in. Try to arrange for at least two people to work at the garage sale all the time, so no one is left alone. Will you welcome antique dealers before the sale begins? And you should have sales receipts for anyone who needs one. All hands on deck... If you have a lot of stuff for sale, you need to have extra people available for the first hour or two of the sale. Why? To watch people, of course, so they don't steal your stuff. There's folks with 'sticky fingers' everywhere, and your garage sale isn't an exception. In fact, it's an opportunity for thieves. Decide how to handle theft from the beginning. Keep your valuables close to where you'll be sitting so you can keep an eye on them. Don't leave your cash where people can see it. If you have jewelry, try to put it where it can be seen but you have to supervise anybody that wants to handle it. I learned these tips about theft the hard way, at my retail store. 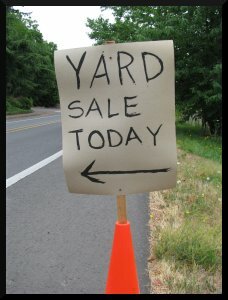 Post-sale clean-up-- Take down your signs the same day your garage sale is over. Old estate and garage sale signs are one of my pet peeves. And they're just-plain ugly in the neighborhood! Arrange with a charity organization or someone else to pick up what's left-over. There's people advertising that they'll pick up your garage sale left-overs. Remember what I said about 'trash and treasure'? 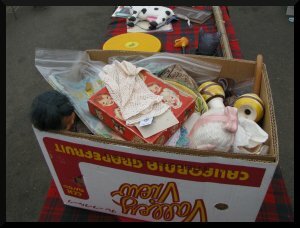 Just call somebody, because the idea of having a garage sale was to make your stuff go away, not take it out for an airing in the driveway and then store it again. If you follow these tips, I still can't guarantee that you'll make a ton of money, but you are more likely to do better. By planning ahead, you'll save yourself a lot of headaches and that's worth a lot. Maybe you'll meet neighbors you've never met before. At least, it will give you a chance to go through your stuff, and evaluate it. If you hate the garage sale experience, maybe you'll think it over before the next time you go shopping to bring home more stuff. Good luck with your garage sale!